I’ve been experiencing interconnectivity, leading me to a deeper understanding of how it works. In recent months I have been integrating various streams of knowledge and skills that I have accumulated over the past few years. Can you recall a time in your own life when it all comes together in new creative ways? That seems to be what is going on with me this year. As many of you may know, I offer slow tours of the Burren where I live, based on some of my books and also on my keen interest in sound and dowsing to help reconnect us with nature, an imperative action for the times we live in now. I have been quietly amazed at how clients who enquire about a tour or workshop then ask for a BIOFIELD TUNING. In that way, I have discovered a new interconnectivity in what I do! It is a lovely combination to tune and integrate the energy field of a body and then to tune into nature and thereby tune in our “elemental body” that so many neglect. By using sounds such as played with a gong and a drum people automatically connect deeper with the essence of a place. IF YOU WANT TO BOOK A BIOFIELD TUNING SESSION you don’t have to be present- I get equally good results from a distance using Zoom of Skype or even totally remotely with a follow up email. So if you feel stressed of want to boost your self – awareness do get in touch! I found the birds love being around the forks and we even had dogs barking in the distance whenever I found something blocking the energies in his field! It was like being in a symphony of nature. 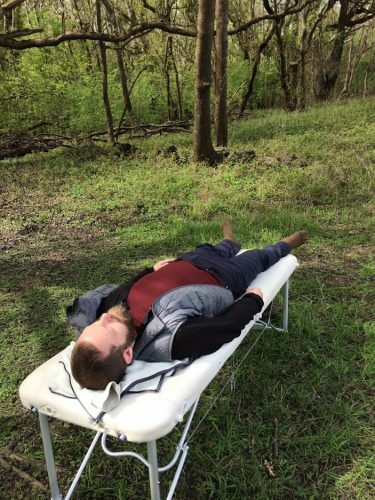 For those who attending local workshops I lead, the toning I introduce with tuning forks also helps us connect with place, and more specifically with the trees growing there. I suggest connecting with trees since they are the guardians of place. Trees are closest among the plant kingdom in their ability to relate to human feelings. The trees respond positively to toning. Dowsing before and after the toning exercises reveals their response. 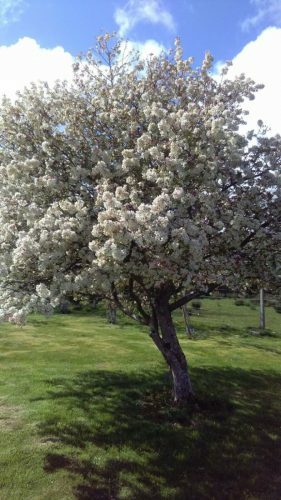 There is a very benevolent apple tree in Kerry I love and the owners of the land sent me a recent photo of it in blossom. By good fortune I have found myself in an international pod of biofield tuning to which I have to contribute weekly, I have started doing a monthly tuning referring to the qualities of the current Celtic Tree month, that is based on the ancient lunar calendar. I again was quietly amazed at how many in the pod told me the treatment was spot on for them. It seems we all have underlying health and emotional rhythms that are influenced by ancient ways of thinking. We may live in modern and often stressful world but the undercurrents are still carrying subtle rhythms for our wellbeing if we tap into them. So I have discovered a way to integrate the knowledge in my latest tree book with biofield tuning, as I know which chakras and half chakras are related to each tree essence. In the next workshop takes place during the Hawthorn month; I am bringing along my set of tree essences along for anyone interested in having one. To bring biofield tuning into my nature work, and conversely to bring my nature knowledge into biofield tuning sessions is indeed a perfect symbiosis that I never had thought of when I undertook the training. I see how the vibrations emanating in nature dovetail with our own. I feel this is blessed knowledge. Most of all Biofield Tuning has enabled me to see the interconnectivity of the all in a more conscious manner than I did previously. When we look at the world from the point of view of frequencies, we learn how simple everything becomes.